Since becoming an Ambassador for Rowan most of my knitting has been focussed on designing a garment of some kind using just one ball of yarn. The latest yarn to get my attention is Rowan All Seasons Chunky. 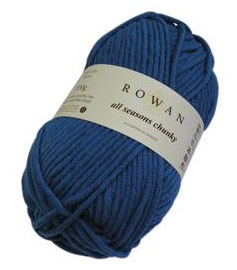 Rowan’s All Seasons Chunky is a bulky-weight version of the popular All Seasons Cotton. It has the same textural, tightly twisted multi-ply construction and is a 60% cotton/40% acrylic microfibre mix. This fibre mix gives the yarn all the great qualities of cotton but without the heavy and starchy feel that sometimes comes with cotton yarns; the resulting material is very light and soft. Undoubtedly, great for summer and winter designs, as the name suggests. The fact that it is a thick chunky yarn means it will knit up really fast; your projects will fly off the needles or hook! (Recommended needle size is 7mm/US 10.5). 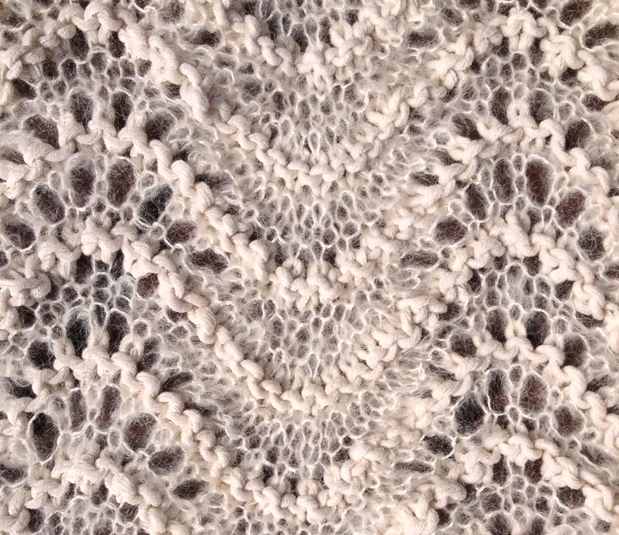 It has fantastic stitch definition making it ideal for cables and textured patterns. It is available in 14 different colours including a white, blues and purples, an orange, a red, a green and a light brown. Click here to see Rowan’s the full colour range. When I received this yarn from Rowan the obvious one ball projects ran through my mind like a hat or a scarf but then I had an idea that I would like to use it some with Kidsilk Haze from my stash; I even wrote a blog about my thoughts. Kidsilk Haze is one of Rowan’s popular yarns. It is a beautiful and versatile fine yarn made from a blend of super kid mohair (70%) and silk (30%). It is so popular that Rowan has a whole ‘family’ of Kidsilk Haze yarns: Eclipse; Glamour; Stripe; Trio. I truly love this yarn. You can make anything with it: use it as it is; double it up on its own or with another yarn. It’s lovely fluffy aura means that you can knit on small needles if you want a fairly tight-knit fabric (3¼mm/US 3) or larger needles (up to 5mm/US 8) if you want something a little more airy or lacy. It comes in 36 great colours too. 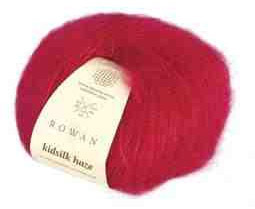 Click here to see the Rowan’s Kidsilk Haze colours. At first, to combine these two yarns seemed rather crazy as they are so very dissimilar and appeared incompatible but their disparity was the quality that was rather attractive to me. Eventually I settled on a shrug using the ever popular feather and fan stitch. I wanted to use the wave-like characteristic that would be created by this stitch at the cast on and cast off edges for the neck line and hemline. (See detail of Feather and Fan Stitch on the right). After a little bit of experimentation I worked two rows with All Seasons Cotton Chunky and four rows with two strands of Kidsilk Haze held together with size 9mm knitting needles. As my knitting began to grow the polarity of these two yarns disappeared and combined together to form a beautiful soft material. The All Seasons Chunky gave the shrug a kind of weight that the Kidsilk Haze does not have on its own and the Kidsilk Haze gave the All Seasons Chunky a fluffy aura. The final material reminded me of a lambs fleece: soft and cuddly with a sumptuous floppy drape. This result far outreached my expectations! 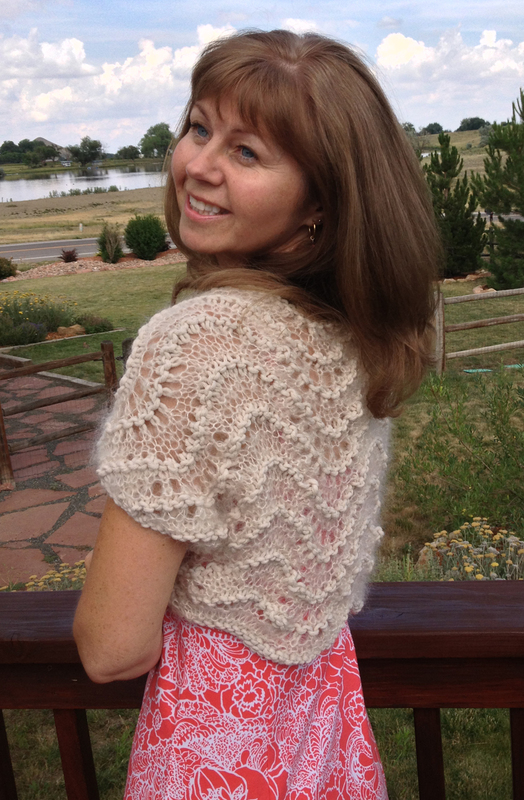 You can see from the pictures that I used the scalloped edge created by the feather and fan pattern stitch to curve around my neck and around my waist. The knitted material was also nice and stretchy but as I used the All Seasons Chunky yarn for all the edges it gave the shrug some stability. Being a chunky yarn it did knit up extremely quickly and was very easy to handle as was the Kidsilk Haze. If you would like to use this yarn Rowan has published a pattern book, the All Seasons Chunky Collection, featuring 12 designs for women by Marie Wallin using All Seasons Chunky. One of my favourites from this collection is Aphrodite, pictured left, but it includes 6 other sweaters, 4 cardigans and a dress. Please do let me know what you think about my shrug and if you have used Rowan’s All Seasons Chunky or Kidsilk Haze what do you think about these yarns? If you would like a copy of my Dolly Shrug it is available to buy on Ravelry. Click here. If you would like to subscribe to my blog please click here and send me your details. Thanks for visiting!